Scientists have discovered a new monkey which has a very typical nose. It looks as if the nose is cut down from its face. It is named as Snub Nosed Monkey. It sneezes continuously if it gets wet under the rain. These monkeys live in the jungles of China, Vietnam. A new species of fish is discovered recently. It has a special characteristic of eating wood. It eats away the wood that is seen immediately. 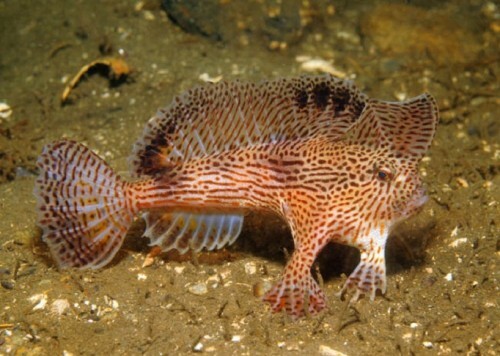 It is named as Armed Wood Eating Cat fish. This species of fishes live in the rivers of Amazon forests in Peru. They eat away the trunks of the trees in the water as food. Their teeth will be stronger in the shape of a spoon. These fishes can grow to a length of 70 centimeters. There are also living beings in the world which do not require oxygen for making up their living. A proof was also obtained recently proving this concept. Scientists have discovered a new living organism belonging to the family of Loricifera. It has a special internal system made of Hydrogenims in its body with the help of which it could generate energy without the oxygen. This new species was discovered recently. They live at the bottom of the sea where oxygen is not available. These species have been existing for the last 60 crore years. We know that fishes swim but do not walk. But there is a fish called Hand fish. These fishes walk on the bottom ground of the seas using its gills. These fishes could grow up to 10 centimeters length. Scientists have discovered 14 new species in these fishes. These fishes live mostly in Australia. In Vietnam, a lizard is used as a food item. Vietnam people are cooking and eating them. But scientists have revealed that this species of lizards are new to the world. In this species, female lizards are capable of giving birth to children without the help of male ones. Longest insect in the world was discovered recently in this year. It is called Chance Megastick. It looks like a dried branch of a tree. It grows to a length of 57 centimeters longer. It was discovered in the forests of Bornia. Female insects in this species grow longer than the male ones. Female insects lay only one egg at a time. A new species of snail is discovered recently. These snails are beautiful with green color. These snails live in the mountain areas of Malaysia. Its tail is the attractive. Its tail is three times longer than its head. It sleeps by wounding the tail around the head.